Southern Illinois University Edwardsville Head Start/Early Head Start is one of several area agencies that have joined to help improve the lives of children, including expectant parents and children birth through five years, throughout the Greater East St. Louis community. “We don’t have to compete for children. 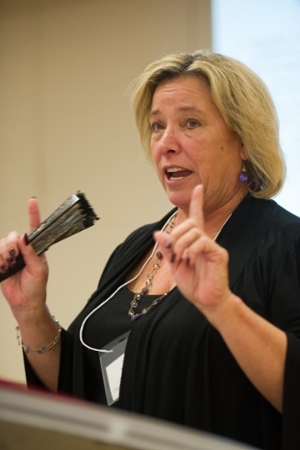 We need to align ourselves and our programs to meet the many needs of children and their families,” said Gail Nelson, Quality Rating Improvement System Policy director with the Illinois Governor’s Office of Early Childhood Development. Nelson was one of several speakers at the Greater East St. Louis Early Learning Partnership & Innovation Zone Annual Stockholders’ Meeting on Wednesday, Nov. 4 at the East St. Louis Higher Education Campus in East St. Louis. More than 60 people from various agencies and businesses with an interest in early childhood attended the meeting. “This day was about recognizing and celebrating the work of the Greater East St. Louis Early Learning Partnership & Innovation Zone,” said Lynnie Bailey, program director for the SIUE East St. Louis Head Start/Early Head Start Program. “The spirit of our work and of this day is partnership,” Bailey continued. “We realize that in order to make a lasting impact, we can no longer just think about our individual program’s enrollment, but rather acknowledge that the children in East St. Louis truly are all of our children. Further developments resulted in 2012 when the Greater East St. Louis area was selected as one of seven Innovation Zones as part of the state receiving a Race to the Top Early Learning Challenge Grant, according to Janice Moenster, coordinator of the Greater East St. Louis Innovation Zone. “In the world of academia, the outcomes of our collaborative efforts in East St. Louis are being talked about nationally,” Bailey said. “The work of the Greater East St. Louis Early Learning Partnership and our continued commitment to young children and their families is part of SIUE’s mission to support the larger community. The SIUE Head Start/Early Head Start Program is a nationally recognized quality early childhood education program that promotes school readiness for children and self-sufficiency for families. Services are available to St. Clair County expectant parents and families of children ages six weeks to five years old. The SIUE Head Start Program currently provides services to 1,221 children and families and the SIUE Early Head Start Program serves 196 children and families. Both programs include children with specialized needs and English as Second Language Learners (ESL). 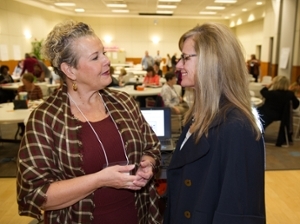 (L-R) G. Lynnie Bailey, SIUE Head Start/Early Head Start program director, talks with Janice Moenster, Greater East St. Louis Innovation Zone coordinator, before the Annual Stakeholders’ Meeting. Gail Nelson, Quality Rating Improvement System Policy director with the Illinois Governor’s Office of Early Childhood Development, addressed a crowd of about 60 at the Greater East St. Louis Early Learning Partnership & Innovation Zone Annual Stakeholders’ Meeting.